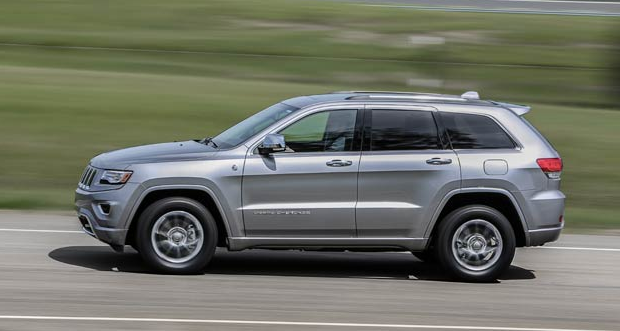 At Davis Dodge, we offer the most awarded SUB ever, the Jeep Grand Cherokees! 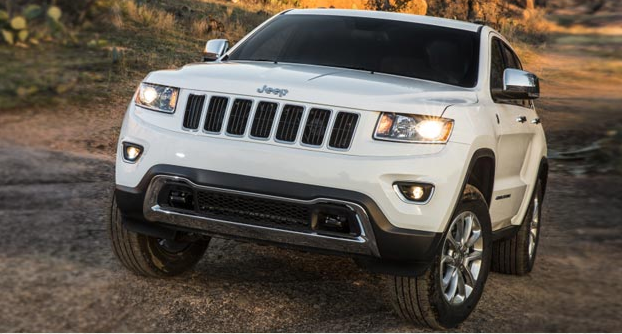 Best-in-class 4x4 capability, fuel economy, power and towing, the Grand Cherokee offers over 90 different security features as well! 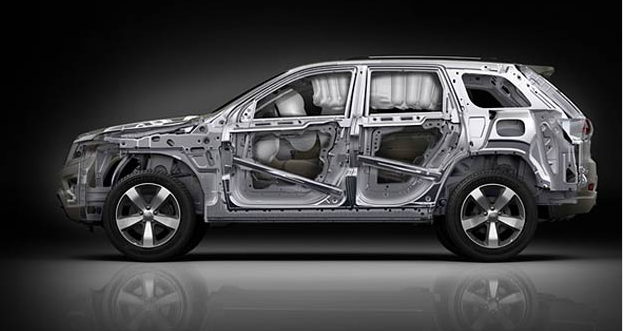 There are 5 different model trims, including the Laredo, Limited, Overland, Summit and SRT. Talk with one of our representatives today, and learn why vehicle buyers come from Calgary, Lethbridge and Pincher Creek for a shopping experience at Davis Dodge. Inside, the uncompromising quality, luxury and craftsmanship can only be summed up as world class. Please your senses with high levels of luxury and sophistication. The Overland® comes standard with a beautifully stitched leather-wrapped instrument panel, as well as a heated wood and leather-wrapped steering wheel. The Summit® features a premium suede-like headliner, illuminated doorsills and a Berber carpet mat for the rear cargo area. 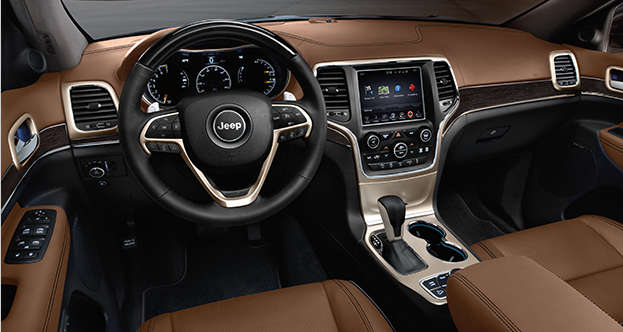 Choose from a host of available leather seat options and interior trims including genuine wood accents. 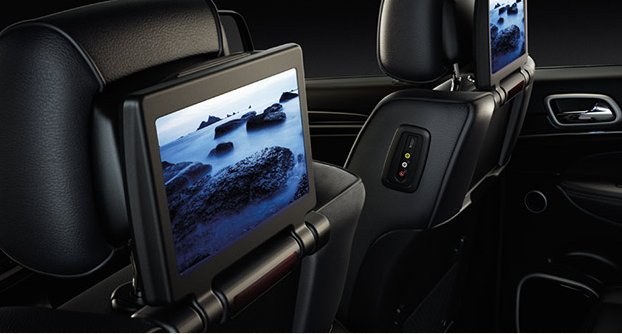 A 12-way power driver's seat including 4-way lumbar adjust comes standard. 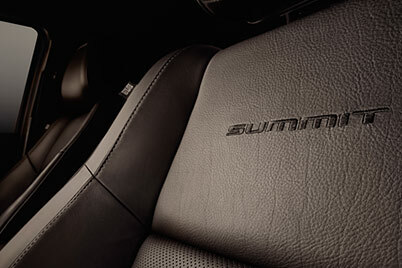 The Limited, Overland®, Summit® and SRT® models add a 12-way power passenger's seat finished with available Nappa, Natura Plus or premium Laguna leather. Premium soft-touch surfaces inside create an elegant and refined look. A leather-wrapped steering wheel, available stitched leather instrument panel and new ergonomic shifter design are just some of the highlights. Acoustic windshield glass now comes standard on all models and combines with a double-dash construction for exceptional sound isolation. The Summit® model goes one step further with 2nd-row acoustic glass. 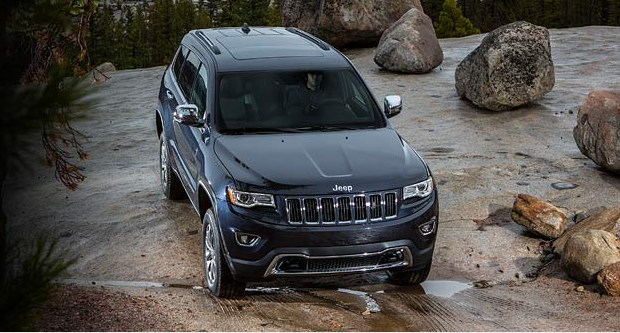 The Grand Cherokee's design is the culmination of luxury, refinement and precision. 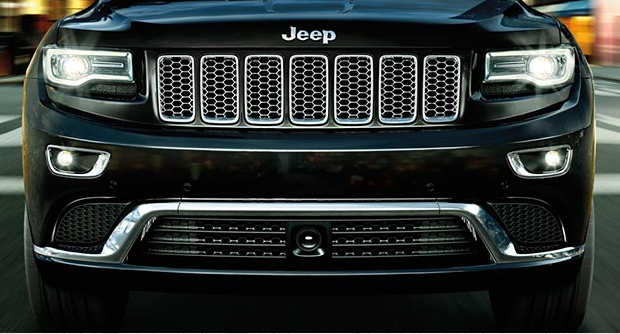 Its muscular lines flow around details like the finely executed headlamps with available LED daytime running lights and signature 7-slot grille that's unmistakably Jeep®. Available chrome accents and bold aluminum wheel designs allow you to personalize the exterior, along with brilliant paint colours like new Light Brownstone Pearl*, Velvet Red Pearl, Ivory Tri-Coat Pearl* and Luxury Brown Pearl*. The luxurious Summit® model personifies true curb appeal. The 20-inch polished Satin aluminum wheels capture the eyes, while the bi-xenon HID headlamps shine with precision and elegance. The body-colour grille with bright insert, chrome accents and distinguished front fascia continue the refined design. Inside, prepare yourself for the luxury of Natura Plus leather seats and a premium suede-like headliner. Canada's most powerful SUV looks fast even at a standstill. 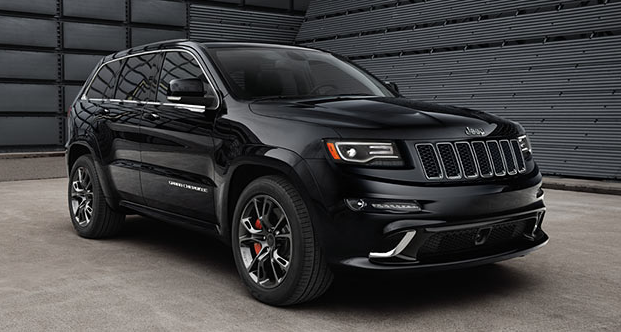 The Grand Cherokee SRT® features blacked-out bi-xenon HID headlamps, taillamp and front grille, red-painted Brembo® calipers and vented hood, which are the first signs of its massive 475 horsepower. The 20-inch forged aluminum wheels lay down brutally fast acceleration times with style, and as the Grand Cherokee SRT® disappears into the horizon, the integrated 4-inch dual black exhaust tips create the perfect parting shot. The available chrome tow hooks, door handles, grille and exterior accents aren't the only things that shine. The Laredo and Limited models come standard with automatic quad halogen projector headlamps and projector fog lamps. Overland® and Summit® models feature bi-xenon HID headlamps with auto-levelling, while the SRT® adds a blacked-out treatment for an aggressive look. All 3 models also come with LED daytime running lights. 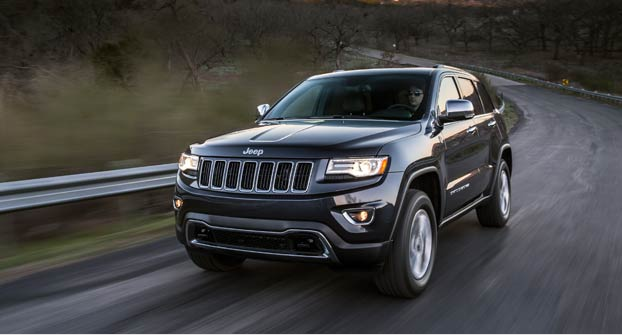 The 2016 Jeep® Grand Cherokee gives you improved fuel economy in the 3.6L PentastarTM VVT V6 thanks to new Stop/Start technology, along with Best-in-Class fuel economy20 as efficient as 8.4 L/100 km (34 mpg) highway45 with the 3.0L EcoDiesel V6. The versatility of 8 speeds allows for smaller steps between gears when compared to a 5- or 6-speed transmission. Along with a multitude of shift maps, this helps deliver stronger acceleration, increased fuel efficiency and impressive power at all speeds. This transmission also initiates exceptionally fast and smooth gear changes, resulting in ride quality that rivals the most luxurious sedans. 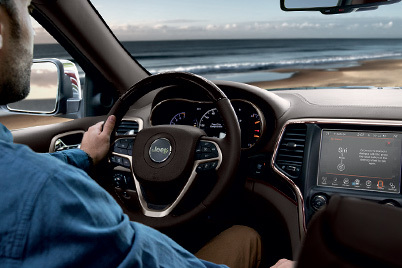 Sport mode now comes standard, and the steering wheel-mounted paddle shifters add yet another element of driver control. 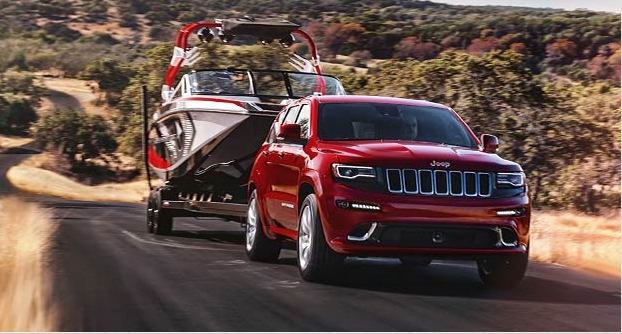 Whether it's hauling a boat or an RV, the Grand Cherokee has the capacity to execute your adventurous ambitions like no other. That's why the 6.4L SRT® HEMI® V8, 5.7L VVT V8 and 3.0L EcoDiesel V6 give you Best-in-Class towing of up to 3,265 kg (7,200 lb)3. The 3.6L PentastarTM VVT V6 also leads the way with Best-in-Class V6 towing of up to 2,812 kg (6,200 lb)3. Trailer Sway Control comes standard on all models for secure handling and added safety. or II, perfect for Albertan prairie roads. The Class-Exclusive Quadra-Lift® Air Suspension3 comes standard on Overland® and Summit® models, and is available on Limited. Using air springs, you can adapt to a wide range of conditions by lowering the vehicle up to 25.4 mm (1 in) for easy entry and exit, or raising it for Best-in-Class ground clearance of up to 274 mm (10.8 in)3. The system provides 5 height settings including Aero Mode. This mode is controlled by vehicle speed and automatically adjusts the ride height for optimal performance and fuel economy. 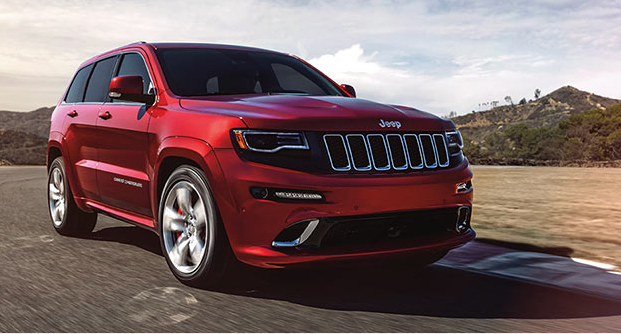 The Grand Cherokee SRT® is a highly advanced performance machine. Powerful 6- and 4-piston Brembo® brake calipers clamp down on massive 380-mm front and 350-mm rear rotors. Stopping power is critical when you have 475 horsepower and 470 lb-ft of torque under your right foot. 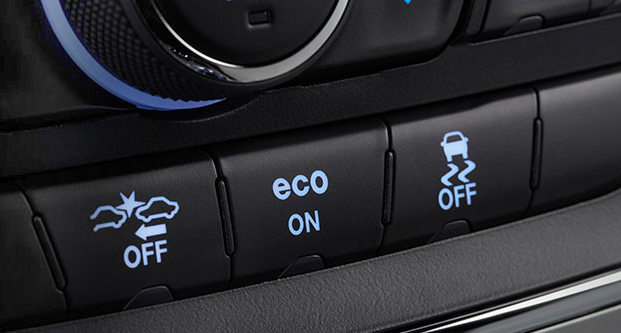 The Selec-Track® traction control system provides settings for Tow, Snow, Auto, Sport and Track. Top track speed reaches 258 km/h, while launch control helps lay down 0–100 km/h times in under 5 seconds. Welcome to Canada's most powerful SUV. 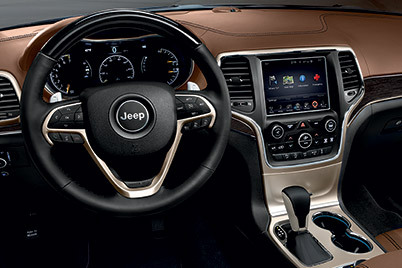 The standard 7-inch full-colour customizable in-cluster display is your central command. It keeps you up to date on vital vehicle data and integrates with the advanced Uconnect® multimedia centre. In addition to data like trip information, tire pressures and fuel economy, it also shows what music you're listening to and displays turn-by-turn directions from the available navigation. The Uconnect® multimedia centres entertain and connect you with features like hands-free communication with Bluetooth® streaming audio. 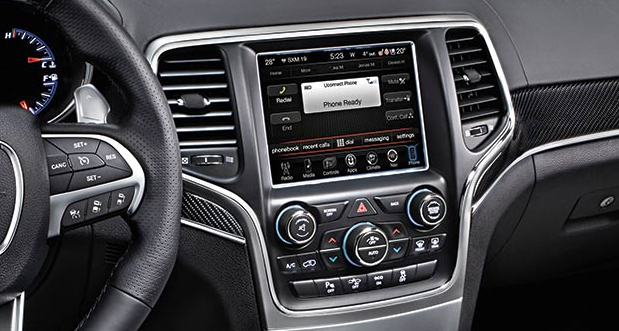 A 5-inch touchscreen comes standard on Laredo and Limited models, with a Class-Exclusive 8.4-inch touchscreen standard on Overland®, Summit® and SRT®. An 825-watt harman/kardon® audio system with 19 speakers is available for studio-quality sound, while rear entertainment is handled by the optional Blu-ray®/DVD system with seat back-mounted screens. Drag and Drop Menu Bar – Organize the home screen like a smartphone by prioritizing it with all the apps and systems you use most for easy access. Siri Eyes Free – Compatible with iPhone 4s and up, send text messages, make calls, change songs, set reminders and more with natural voice commands. Do Not Disturb – When you don't want to be interrupted, you can automatically route incoming calls to voicemail, or reply with a preset text message by simply pushing a button. Every model comes standard with Electronic Stability Control, which uses advanced sensors and works with systems like the antilock disc brakes. 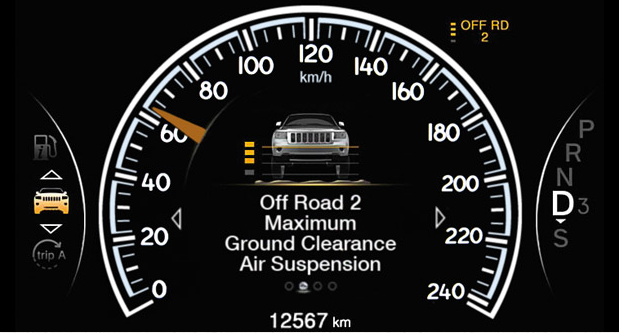 It can reduce engine power and apply individual brakes to keep you in control when a loss of traction is detected. 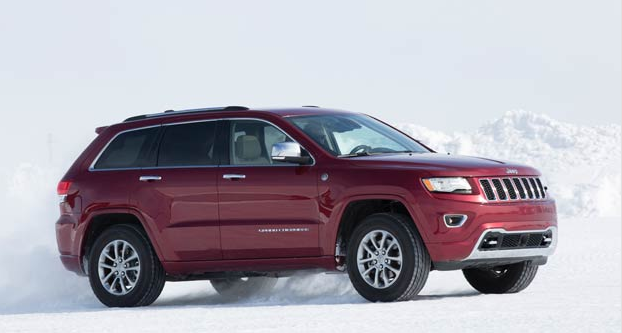 Hill Start Assist, Ready Alert Braking, All-Speed Traction Control, Rain Brake Support and Trailer Sway Control are included to help keep you safe wherever the Grand Cherokee takes you. 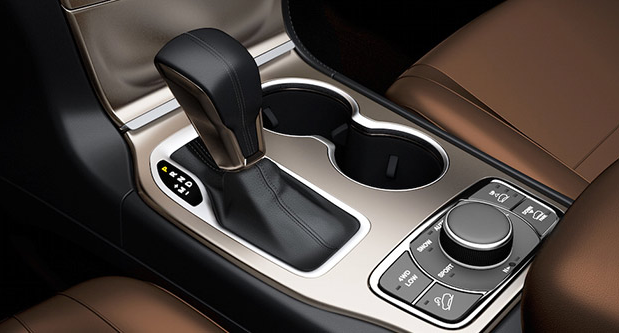 This available system saves you from having to constantly readjust the cruise control due to traffic conditions. It uses video and radar sensors to automatically maintain your preset speed and vehicle distance settings. 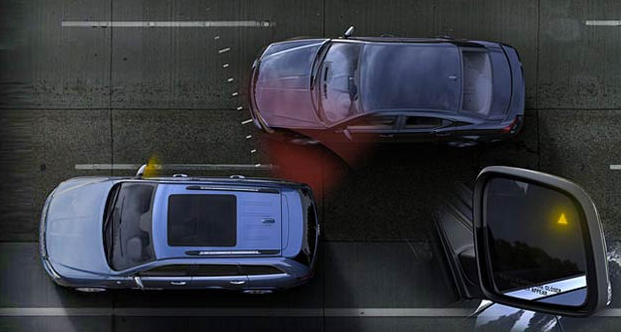 In certain circumstances, this advanced system can detect an impending collision and bring the vehicle to a complete stop without any driver intervention. When the turn signal is activated, Blind-Spot Monitoring warns you with an audible alert and visual icon on the sideview mirror when a vehicle enters your blind-spot area. Rear Cross-Path Detection is included and uses sensors to alert you of vehicles and objects approaching from either side as you reverse out of a spot. Both systems are standard on the Summit® and SRT®, and available on Limited and Overland®. This available system alerts you when you're approaching a vehicle or obstacle at an unsafe speed. 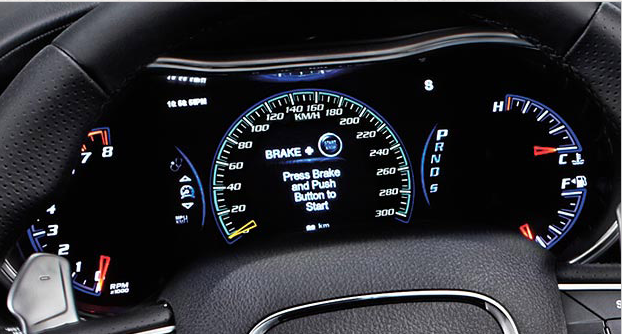 It provides an audible and visual warning, and also prefills the brakes to prepare for emergency driver intervention. If the driver fails to respond, it briefly engages the brakes to further alert the driver. If there is still no response, the brakes are applied to slow the vehicle before impact. In certain situations, the system can also bring the vehicle to a complete stop. Every model comes standard with 7 air bags including advanced, multistage driver and front passenger air bags, supplemental side-curtain air bags and driver's knee blocker air bags. You also get active head restraints. They can reduce the risk of injury by minimizing the distance between the restraint and the occupant's head during a rear-end impact. 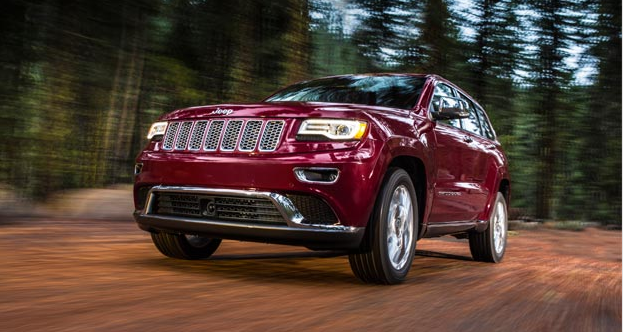 Take a look at the Jeep Grand Cherokee today!